Item #C3563 adjustable from 35" - 63"
1. Remove the hanger bracket from the hanger rod by pulling one end of the bracket off of the hanger rod (Figure 1).Set the hanger bracket aside, you will use it in step four (4). Find the center point along the top edge of the quilt by folding the quilt in half (widthwise) and mark the center fold with a straight pin (Figure 1a). 2. Place your quilt on a flat surface with the back side up. Make sure the sleeve lies flat and straight. Lay the hang it dang it on the sleeve with the center mark aligned with the straight pin (Figure 2). Loosen the end tubes with a slight twist and extend each end tube out to the edge of the sleeve and gently retighten (Figure 2a). It takes very little effort to lock the tubes in place, be careful to not over tighten them. At this point, the center mark of the hang it dang it should align with the straight pin and the end tubes should align with the outer edges of the sleeve. 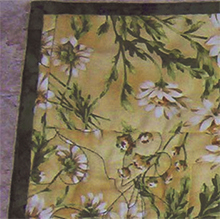 Hang your quilt on the wall and enjoy! All the while knowing you can change quilts just as fast and easy! 5. 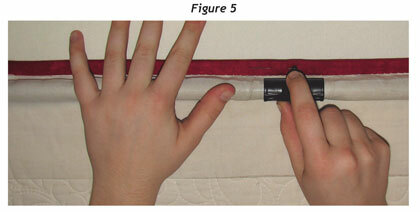 To remove the hanger bracket place your quilt on a flat surface and hold the rod down with one hand and with your other hand, pull the bracket off by pulling back on the tab (Figure 5). If your quilt is not hanging level, this either means the hanger bracket is not centered or the weight is not evenly distributed. You can adjust this by grasping the quilt and hanger rod in one hand and sliding the hanger bracket slightly towards the lower hanging corner. If this does not solve the problem, go to step 6 and then repeat steps 1 through 4. 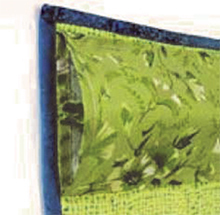 If your quilt does not lay flat on the wall or puckers in the front, check your sleeve to see if it has enough room to accommodate the hanger. Your sleeve should look like the regulation style quilt sleeve on the left. If your sleeve is flat like the one on the right, you will need to move the bottom edge up or remove a section in the middle creating a two part sleeve. © Hang It Dang It. All rights reserved.